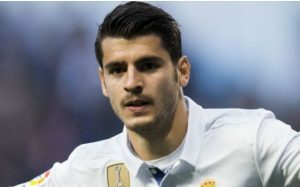 Atletico Madrid have reportedly opened talks with Chelsea over the possibility of signing Blues’ forward Alvaro Morata. According to Sky Sports, Diego Simeone wants to recruit another forward to partner Antoine Griezmann at the Estadio Wanda Metropolitano. Diego Costa has struggled this season having only scored one goal so far this season. On a similar theme, Morata has also been a disappointment at Stamford Bridge following his big money move from Real Madrid in the summer of 2017. In 72 appearances for the West Londoners, he has only scored 24 goals – only five of which have come in the Premier League this season. He was not even included on the substitutes bench this weekend as Chelsea overcame Newcastle United 2-1 at Stamford Bridge. The 26-year-old has also been linked to moves to fellow La Liga sides Barcelona and Sevilla in recent weeks. Should the Spaniard depart Stamford Bridge, there are also rumours that Chelsea will make a swoop for Bournemouth’s Callum Wilson or AC Milan’s on-loan forward Gonzalo Higuain. Morata, meanwhile, can be backed at 1/2 with Coral to join Atletico Madrid before the upcoming closure of the January transfer window. Elsewhere, a price of 10/1 is available for him to make a surprise switch to Serie A and AC Milan.